GEORGE BRANDIS MADE THIS COMMENT during a discussion about his government’s proposed changes to the Racial Discrimination Act. Critics of the proposed changes say the amendments are not really designed to protect free speech – which the government argues has been hobbled by certain sections of the laws as they have stood for nearly 20 years – but are in fact designed to allow (even encourage) bigoted attitudes to flourish. This, the critics say, is typical of political conservatives’ view that curbing “offensive” discussions about minority groups is a form of political correctness, which in their eyes is an inherently evil practice. 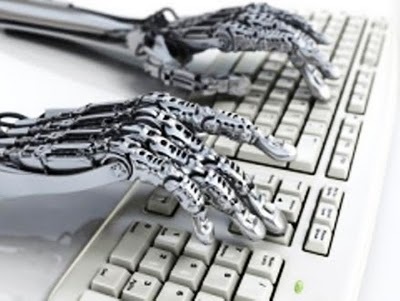 The BBC reported recently that the LA Times became the first newspaper to use a robot to write an article. The piece, about an earthquake in California, was a report generated by an automated algorithm that collated data from the US Geological Survey and inserted it into a template. This is a good development for journalism. Algorithms might be able to pull together information from trusted sources and spit out simple reports. But until it can understand the context and background of an issue, identify and interview the key voices in a debate, weigh competing claims and tell the difference between fact-based claims and opinion, robo reporting won’t replace journalists. If anything, automated reporting will free journalists to concentrate on producing more long-form quality journalism with deeper, more valuable insights. In a world awash with information and attitude masquerading as fact, that has to be a good thing. The “old media” mantra of “if in doubt, leave it out” has been replaced in the online journalism age by “if it’s wrong, it won’t be for long”. But despite the promise that the internet delivers a kind of self-correcting crowd-sourced “truth” that can match the efforts of traditional media, even some pop culture newsrooms such as BuzzFeed are finding that it makes business sense to get your facts right. This piece, from the Columbia Journalism Review, suggests that authority, credibility and the trustworthiness of information still have currency. The question “Who cares if it’s true?” has been answered. We all care. Social media and citizen journalism might mean that the public gets there first with “the news” but trained journalists are increasingly crucial as gatekeepers of what is worth knowing and what is accurate, and to highlight issues that might otherwise evade scrutiny. Time, judgement and the skills to report accurately will never go out of fashion. True information and false information travel at the same speed online. That means there is still a vital role to be played by the more traditional press and media even if they stand to lose the race for breaking and short-lived spectacular news tsunamis and #infostorms, like when a giraffe named #marius is killed at a Danish zoo. Read the original article by Vincent F Hendricks at The Conversation. More and more, social media is reporting from the frontline of news events, taking us faster and closer to what’s happening around us, often before traditional media has realised there’s something going on. How trustworthy is such a scattergun approach to reporting? The Guardian‘s Ellie Mae O’Hagan has some thoughts on the matter, here. Huppke’s piece is worth revisiting. Bad grammar? Sorry, don’t believe you. Maybe I’m old school, but badly edited content – poorly written copy, copy with obvious mistakes in it – affects how much I trust a news source. 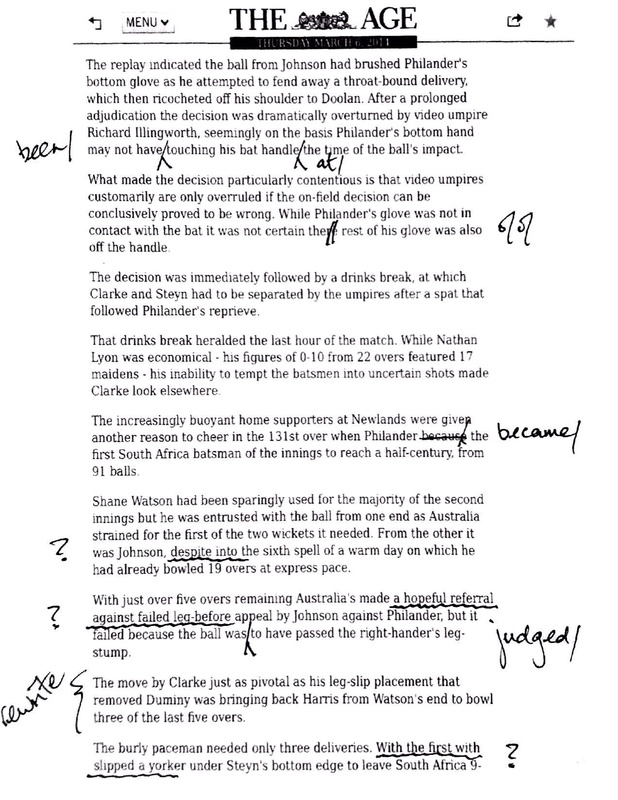 The screen grab below comes from the iPad edition of The Age‘s report on the series-deciding Third Test between Australia and South Africa. The game ended just before 3am Australian Eastern Standard Time (and what a thrilling finish it was), so the paper did well to get the report out to local readers in time for breakfast. Unfortunately, the need for speed overran attention to detail. This is an extreme example, but errors like these have become common even in reputable news outlets. Addiction to speed, cost-cutting production processes and a lack of care factor mean readers see mistakes made every day by organisations that want us to believe that their content can be trusted. Do readers care? I do. Speed of news should not come at the cost of accuracy or clarity. In an increasingly crowded world of instant information the need for journalism that explains – not just reports – what is going on is crucial. It’s crucial to an informed population, to democratic process, to holding those in power to account for their actions. Being first with the news <is> important but depth and accuracy must always trump speed. Mathew Ingram at GigaOm recently took a look at some US media start-ups that focus on explanatory journalism. Check out his piece here. The federal Minister for Communication reckons there’s still value in printed news. This is an extract from the speech he gave at the launch of The Saturday Paper.